This is a dish I made back in the Spring, and it was so good I saved it to share! You remember how much I love Middle Eastern food, don't you? Here is a dish I had forgotten all about for years, until something - I forget what- jogged my memory. Where we live, in Birmingham, UK, all things Turkish seem to be flourishing: Turkish barbers, Turkish restaurants, Turkish groceries... the latter of which is really good news if, like me, you love to try different ingredients, like tahini, mulberry syrup, grape molasses or fava beans. We have also recently become devotees of Turkish black olives; the small and slightly wrinkly ones with the stones in that come in big jars. ... but I digress. Imam bayaldi literally means "The priest fainted": intriguing name for a dish, I thought, so I did a little research and found out that the eponymous imam is supposed to have fainted with delight when he tasted the dish, which his wife had cooked for him. Another story goes that an imam was married to the daughter of an olive oil merchant who gave twelve jars of the finest olive oil as her dowry. 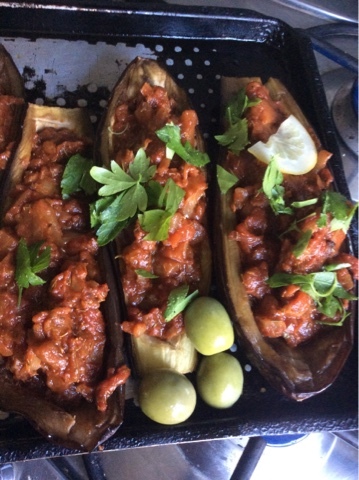 Every day the bride prepared this stuffed aubergine delicacy, which pleased her newlywed husband no end. However, on the thirteenth day the olive oil ran out and she could not cook it. The imam fainted in disappointment. I have to say that nobody fainted in delight when I served this up, but they did enjoy it! Cut eggplant lengthways, scoop out flesh and dice. Roast the halves in a medium-hot oven on an oiled baking tray. Add the other tab olive oil and the diced aubergine to the pan with the cabbage. Simmer with the lid on until soft. Add tomatoes, salt, 1 tsp mixed spice, 1tsp paprika, 2tsps dried oregano/mixed herbs, lg pinch black pepper, 2 tsps lemon juice. 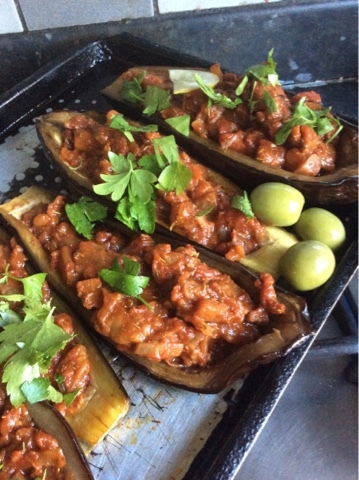 Stuff the aubergines with the mixture and bake in a hot oven. Garnish with olives and chopped flat-leaved parsley. I honestly cannot remember the last time I made Imam Bayaldi and i remember it being rich though, and loving it. I do like your vegan version with the cabbage. I was in Birmingham a couple of months back and really enjoyed it. Did not get to explore the diversity of the city much, but what we saw we liked. 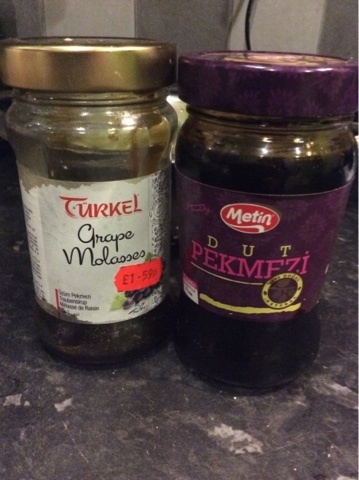 Wish I had stumbled across the Turkish quarter as I'd love to try some mulberry syrup and grape molasses.